A former Wall Street analyst who took up cycling at age 26, Evie Stevens, powered to the top of the sport in a few short years. After setting a new women’s world one-hour record last month, Stevens has her focus set on the Olympic Games in Rio. Speed is second nature to Evelyn “Evie” Stevens. 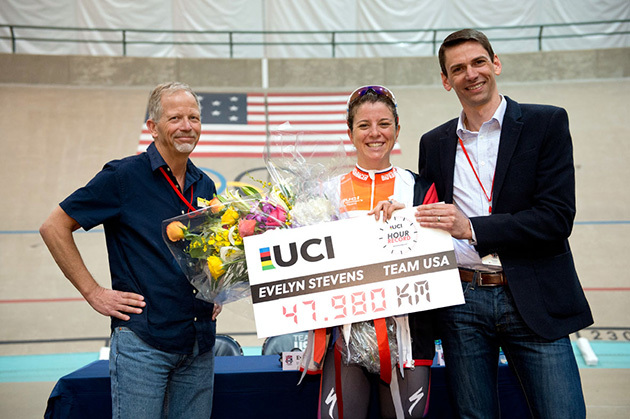 In a performance that mirrored her meteoric rise to the top echelons of competitive cycling, the 5' 5", 123-pound bundle of energy set a new UCI women’s world one-hour record, pedaling 47.98 kilometers (29.81 miles) in 60 lung-searing minutes on Feb. 27, at the USA Cycling velodrome in Colorado Springs. “I knew it would be a mental and physical effort,” said the 32-year-old Stevens afterward. “Forty-five minutes in I felt like I was in the zone, saying, ‘Pedal, push, pedal, push,’ not thinking. Then, with 15 minutes to go, the plan was to squeeze, which I was able to do for a couple of laps. You don’t know your limit until you hit your limit. I think I found it, today. That didn’t happen. Instead, Stevens passed the mark set just five weeks earlier by Bridie O’Donnell (46.882 km/29.13 m) in Australia, by more than a full kilometer. It also puts the record back in American hands, after O’Donnell had eclipsed American Molly Shaffer van Houweling’s record. In cycling parlance, Stevens was “on the rivet” for most of the effort. Her USA Cycling coach, Neal Henderson, declined to share precise physiological data on Stevens’s ride, citing competitive necessity. However, he confirmed that she went from zero to 30 mph in just under 20 seconds, and then held an average speed of 28.81 mph for the remaining 59 minutes and 40 seconds, pedaling at 102 rpm. Stevens expended more than 1,000 calories during her world-record ride. “She was on the upper limit of what we knew she could do early on, not over paced,” says Henderson. “It was right in that range of what we knew she could do. She kept that until 45 [minutes], I asked her for a bit more. She did lift, and had a little difficulty. She was riding some very fast laps toward the end there. No one should be surprised that Stevens would claim the one-hour mark. She has been on the fast track ever since she started pedaling at the age of 26, when she was working as a Wall Street analyst. Her arrival among cycling’s elite is as sudden as it is improbable. Following the summer of 2007, however, things changed dramatically, due to a serendipitous invitation from her older sister Angela, who was living on the West Coast. The pair, along with Angela’s husband, went riding in the hills outside San Francisco, and took part in a cyclocross race. Stevens was intrigued. She bought a moderately priced road bike when she got back to New York City, adjusted to wearing clipless pedals, began participating in group rides, and sought out coaching. Within months, Stevens’s race results were raising eyebrows, with a slew of podium finishes against far-more experienced competitors. In 2009, Stevens decided she was all-in on two wheels. She started the season as an amateur, and finished with a professional contract. Along the way, she left her Wall Street job. She won the venerable Fitchburg Longsjo Classic stage race in Massachusetts—not far from her hometown of Acton—and the Cascade Cycling Classic stage race in Oregon, before entering her first European race (the multi-stage Route de France, where she remarkably grabbed second place) and competing in the world championships in Switzerland (finishing 15th against the best female riders on the planet). She signed with the HTC-Highroad team, and during the 2010 season she rode alongside world-class riders like Ina Teutenberg and Judith Arndt. Stevens moved to San Francisco, putting her career in high finance on hold (“What’s cool is that I’'m 32, and cycling is a very finite sport, she says. “I don’t know if I’ll be back on Wall Street, but I’d love to get back into private equity or the business in some way.”). She now races for the powerhouse Dutch Boels-Dolmans women’s team, which also counts road world champion Lizzie Armistead of Great Britain and American champion Megan Guarnier among its members. This past September, following the UCI world championships in Richmond, Va., Stevens narrowed her focus on the one-hour mark (after taking time to get married to Brett Baker and enjoy a quick honeymoon). She said the training regimen dovetailed nicely with her team goals. For her hour attempt, Stevens selected the 333-meter velodrome in Colorado Springs, alongside the USA Cycling and US Olympic Committee facilities. The venue, sporting a new roof, was admittedly a double-edge sword, with wide corners that fit Stevens’s powerful riding style. Stevens and Henderson both acknowledged that viable record attempts don’t happen without a larger support network. In fact, the two-time national time trial champion said thoughts of those who made the opportunity possible allowed her to keep pushing her 16-pound Specialized Shiv time-trail rig just as she was hitting the wall. Anyone who has ever taken an intense spin class has an inkling of the pain thresholds that Stevens had to reach. But there was no thumping techno soundtrack, and no sprightly instructor exhorting her on. “The hour record is equally physical and mental, maybe even more mental than physical,” she says. “I don’t have any use for music, because I’m so in the zone. I have the data. When I’m on the bicycle, it’s nothing else. It’s purely me, the bike, and the track. At the 45-minute mark, according to the plan that she and Henderson put together, Stevens ramped up her effort, and immediately went “to a dark place” for five minutes. “Up until that moment, I felt like I was in absolute control,” she says. “Those five minutes, I was driven by the physical pain. But I was proud, because I was able to not separate that much, and I was able to bring it back to the track. When it got too painful, I’d say, ‘OK, I can do that one lap, that half lap, that quarter lap.’ Anything is possible if you keep it in that one moment. Following her record-setting ride, Stevens took a few days to celebrate before flying off to Europe to rejoin her Boels-Dolmans squad. The spring World Tour schedule, she says, is likely to play a crucial role in the United States Olympic selection. The U.S. will send a four-woman road team, and two of those racers will compete in the Olympic time trial. Stevens was a member of the U.S. road contingent at the 20102 Games in London, only three years after turning pro, but not selected to race the time trial. “That kind of fired me up for this go-round,” she says. Stevens makes no bones about the time trial at the Rio Games being a major goal. However, since no American placed in the top three of the world championships last fall, which would have guaranteed placement, the spots will likely come down to coaches’ selection in late June. Given Stevens’s track record—and world record—the odds are she can book her flight to Rio now.